Researchers began moving into labs in the new building on Haygood Drive, which features a two-story working bridge and environmentally friendly design. Photo by Aerial Photography, Inc. Researchers began moving into labs in the new Health Sciences Research Building (HSRB) on Haygood Drive after Emory received a certificate of occupancy for the building on April 10. Construction on the 200,000-square-foot building first began in June 2011, following demolition of the Turman West Residence Hall. The $90 million cost has already been completely paid for through philanthropy. Research in the building will focus on drug discovery, immunology and vaccines, neurosciences, cancer, gastroenterology, transplant immunology, nephrology, biomedical engineering, and human genetics. Approximately 58 percent of research space will be pediatric research through the Emory-Children's Pediatric Center, a partnership between Emory and Children's Healthcare of Atlanta. The building is five stories, with four stories above ground and one below. At full capacity (expected to be reached over three years), the building will hold 500 people, including 74 faculty researchers and their teams of postdocs, graduate students, and staff. A two-story working bridge will house researchers dedicated to informatics, outcomes research, public health research and clinical research. The bridge is named the Brumley Bridge in honor of George Brumley, chair of the Emory Department of Pediatrics from 1981 to 1995. Brumley died in a plane crash in 2003. 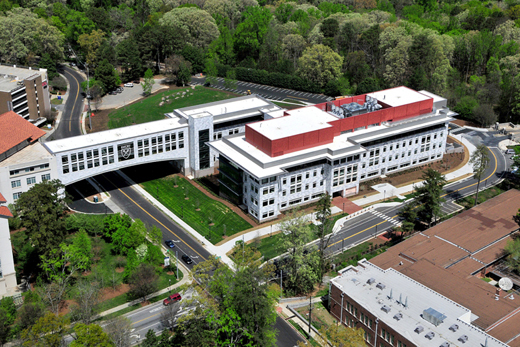 The Brumley Bridge connects the third and fourth floors of the HSRB to the fourth and fifth floors of the Emory-Children's Center building, which is the home of Emory's Department of Pediatrics and is adjacent to Children's Healthcare of Atlanta on Uppergate Drive. An open lab concept features natural light in labs and corridors. The building includes biosafety level 2 and 3 labs. It also features a 160-seat auditorium and a cafe dining area offering breakfast, lunch and dinner, with an outdoor seating option. The building is encased in five shades of marble, notes Charlie Andrews, senior associate vice president for space planning and construction in the Woodruff Health Sciences Center. "In order to appear random, each piece was numbered and placed in an exact location, kind of like a giant jigsaw puzzle," he says. The building was designed by ZGF (Zimmer Gunsul Frasca Architects LLP), and the general contractor was Brasfield & Gorrie. The building is expected to be LEED silver certified, with features such as sensors that ramp down the heating system when the building is unoccupied. During demolition of the Turman dorm and construction of the new building 18,548 tons of waste were recycled, representing 98 percent of all construction waste. Each floor in the new building has built-in containers for composting and recycling, as well as 500 desk-side recycling containers. The below-ground floor houses a “clean” vivarium for research rodents, which means suiting up to enter the facility, special composting equipment, and use of only rodents that are laboratory bred. Donors to the building include the Robert W. Woodruff, O. Wayne Rollins, Joseph B. Whitehead, Zeist, Martha and Wilton Looney, Katherine John Murphy, and Luther and Susie Harrison foundations; David, Helen and Marian Woodward Fund; Georgia Research Alliance; Raymond Schinazi; Margaret Hirst Davis; James and Helen Carlos; and two anonymous donors.